You can find more than 100 species of tropical pitcher plants in tropical habitats in Australia, Madagascar, Papua New Guinea, the Seychelles, Southeast Asia and Sri Lanka. Each species typically grows only in a small area, but several species may live in the same habitat. Like other carnivorous plants, they all grow in areas with nitrogen-poor soil. These beautiful and clever plants collect their nitrogen in hanging, vase-shaped cups, which entice both flying and crawling insects with an intoxicating fragrance, bright color, and sweet nectar. A "lid" curves over the cup's rim, which is often grooved or toothed, and extra-slippery. Plop! An unwary insect slides inside and soon finds itself drowning in a slick-walled vat of sticky, acidic liquid. Bacteria in a tropical pitcher plant's cups play a role in digestion, just as the bacteria in our gut help us digest our food. You could think of a pitcher plant's cup as its stomach! 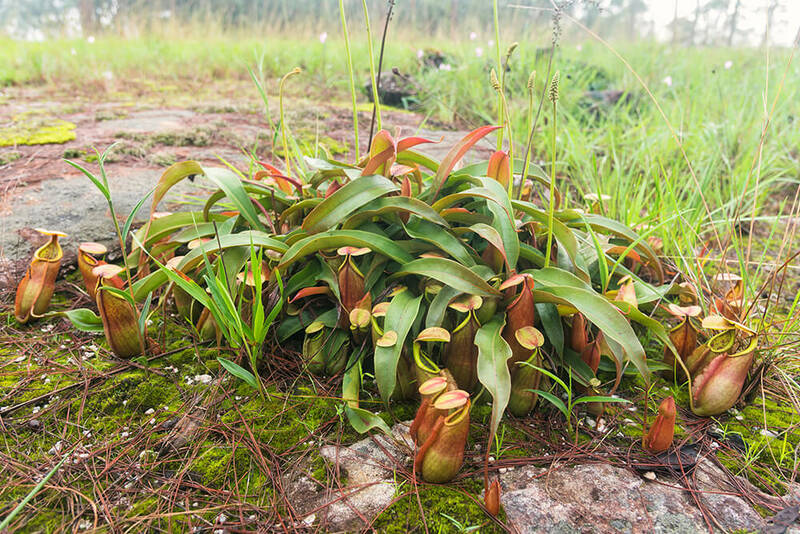 For most species, dissolved insects provide the nitrogen these plants need, but some tropical pitcher plants have other, unique ways of getting their fair share of this essential nutrient. For example, the cups of N. ampullaria have open lids and wide mouths that catch falling leaf litter, which produces nitrogen as it decomposes. Without the need to attract insects, this species lacks the sweet scent and bright color common to most of its relatives. A few other species attract small mammals. The plants don't eat the mammals, though; the real prize is the droppings of these animals, which are high in nitrogen. Some organisms—mostly bacteria but also certain invertebrates, including plenty of larvae, and at least one frog species—are adapted for living in the seemingly inhospitable cup of a tropical pitcher plant. In fact, some of these organisms are species that don't live anywhere else. Some mosquito larvae, for example, complete this stage of their development in the liquid inside a cup, where they eat other types of larvae. In at least one species of pitcher plant, ants live in hollow chambers inside the plant and venture into pitchers to eat trapped prey. The way a pitcher develops is just as fascinating as how it catches prey. What begins as a rather typical, sword-shaped leaf grows a long, strong tendril at its tip. The tendril may curl and loop around another plant for support. Ultimately the tip of the tendril swells and droops, eventually opening to become a remarkable urn-like trap. Most species produce two types of pitchers: "lower pitchers" grow near the ground, and "upper pitchers" grow higher on the plant. Lower pitchers look different than upper pitchers, and sometimes they catch different sorts of prey. Nepenthes species are dioecious, meaning that an individual plant produces either male flower or female flowers, but not both. Several small flowers grow on a long spike. On a female plant, flowers are equipped with carpels (female reproductive structures), and on a male plant, flowers hold pollen. Various insects are known to pollinate Nepenthes species. While a few of the tropical pitcher plants are low-growing, most are climbing vines, supported by tendrils at the tips of the leaves. Some species reach 45 feet (13.7 meters) high into surrounding trees. Some species are epiphytes. Tropical pitcher plants are spectacular specimens, but they need high humidity, warm temperatures, and lots of space. Growers categorize most Nepenthes species as either lowland species or highland species, depending on the elevation at which they are found in the wild, and each type has different growing requirements. 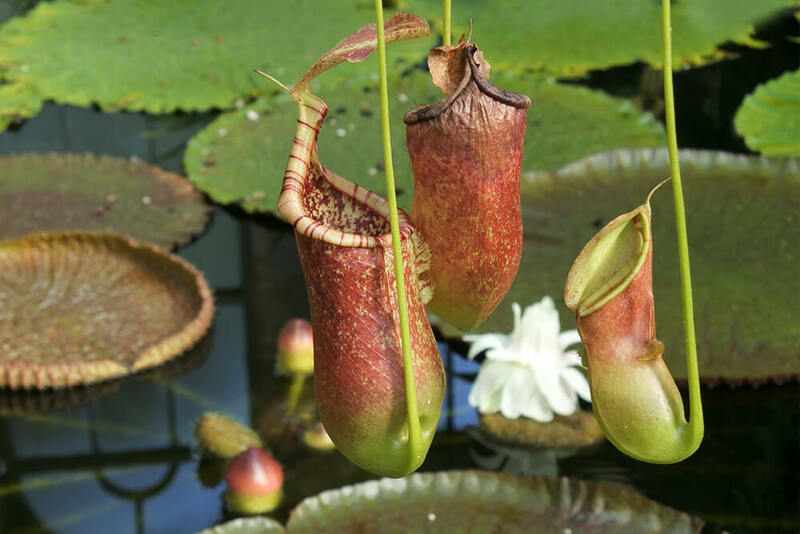 Horticulturists should be aware that poachers remove tropical pitcher plants and seeds from the wild for illegal international sale. Sadly, there is high demand for rare, even endangered, species. 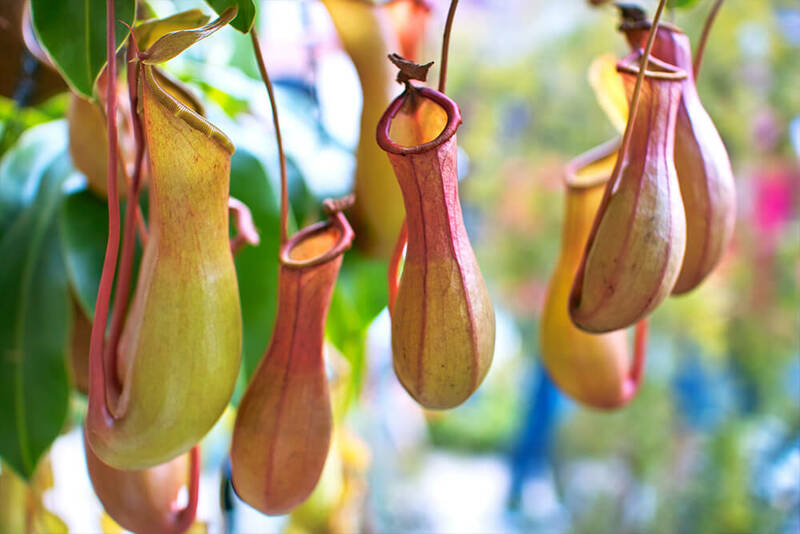 If you decide to grow a tropical pitcher plant, make sure your seeds or plant comes from a reputable source. Of 104 Nepenthes species on the IUCN Red List, 63 species are listed as Vulnerable or Endangered, with 9 of those species Critically Endangered. Sadly, over-collection and poaching for the horticulture trade is a major threat to many of species of tropical pitcher plants. Some groups of horticulturists work to breed rare and endangered tropical pitcher plants, not only to ensure that the species survives, but also to discourage poaching by making nursery-propagated specimens readily available. In addition, logging, agriculture, roads, and human development continue to destroy habitat throughout the range of this genus. Drought and other effects of global climate change may alter habitat too, posing a future threat. Another common name for this group of plants is "monkey cups"—although there doesn't seem to be any reliable evidence that monkeys ever actually drink from the pitchers. A tropical pitcher plant that grows in peat swamps of Borneo, N. hemsleyana produces pitchers with only a small amount of watery liquid and very little scent. But they don't need to attract insects. One particular bat species finds these pitchers just right for roosting during the day. In exchange for a safe place to sleep, the bat pays the plant with nitrogen—in the form of bat droppings. N. rajah, also endemic to Borneo, grows enormous pitchers that can be larger than a football and hold three quarts of liquid. During the daytime, N. rajah gets it nitrogen in the form of treeshrew poo. As the small mammal licks sweet nectar from a pitcher's open lid, it poops—right into the pitcher. At night, a nocturnal rat does the same thing.